Allah, the PROTECTOR loves, helps and defends His creatures who are exclusively endowed with His Grace. He says, “God is the Protector of those who have faith” (BAQARA, 257), “But God is the Protector of the righteous.” (JATHIYA, 19), “That is because God is the Protector of those who believe, but those who reject God have no Protector.” (MUHAMMAD, 11), “And He is the Protector, Worthy of all Praise.” (SHURA, 28). 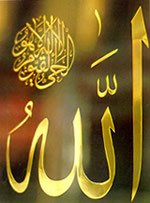 One of the meanings of the verb waleya is to protect and keep safe from harm by guarding and covering, and on Doomsday His Protection is the only protection, “There the only protection comes from God, the True One.” (KAHF, 44), “..and the wrong-doers will have no protector nor helper.” (SHURA, 8), “..but when once God willeth a people’s punishment, there can be no turning it back, nor will they find, besides Him, any to protect” (RA‘AD, 11), “For my Protector is God, Who revealed the Book from time to time, and He will choose, and befriend the righteous” (A‘RAF, 196), “..but it is God, He is the Protector, and it is He Who gives life to the dead, it is He Who has power over all things.” (SHURA, 9). Glory be to the PROTECTOR, Praise and Glory be to Him, He is Allah.